Our lodging guide is full of advice and recommendations for anyone researching hotels in Jasper Alberta Canada. Whether you are looking for a Jasper hotel, Jasper motel, Jasper B&B, or more general information about tours & activities in Jasper National Park, your are sure to find what you need at Jasper Hotels.com. Nestled at the edge of Jasper National Park, overlooking the majestic Rocky Mountains, sits the Overlander Mountain Lodge. This jewel in the Canadian Rockies offers spectacular views, gourmet dining and ultra comfortable lodging in a casual yet cozy atmosphere. 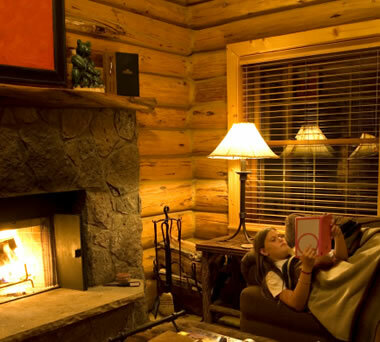 Charming cottages and luxury suites nestled in a secluded forest setting overlooking a pristine mountain lake, just 5 minutes from downtown Jasper. Most units have kitchen & fireplace. Laundry, playground, hot tub, fire pit & BBQs on site. Open May to October. A central location, free breakfast and a wide selection of rooms & suites with impressive amenities, this Jasper hotel is an ideal base for exploring Jasper National Park. 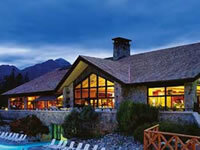 Facilities include outdoor hot tubs, ample parking, free Wi-Fi and ski storage. Just a short stroll from downtown Jasper, Maligne Lodge offers a variety of comfortable rooms and suites, including several kitchen suites. All guests benefit from the indoor pool, whirlpool, sauna, outdoor patio and free wireless internet. Easily the most luxurious hotel in Jasper National Park, the Fairmont Jasper Park Lodge enjoys an enviable lakeside location with a high standard of accommodation, outstanding views and world-class facilities. A remarkable Canadian lodge experience.